Inscribed stone inscription is a script written, products that have been familiar with the era of community literacy and writing activities. Pran inscription has a very important role in bringing information to the public, especially the later generations. Of what is written in the inscription is an activity that can then be identified and serve as a lesson for all. Moreover, the inscription is generally issued officially by the Government in power, or the party who has a dream goal. so worthy of being recorded history. Inscription This inscription is also mempermaklum about power, authority, system of government and community dynamics are summarized in the inscription will be a historical record and also to understand the identity of the inhabitants of this country. That's the significance of existing prarasasti some of them are region Lampung Province. content of the inscriptions in Lampung ranging from kutykan from rulers to the manuscript prayer prayer. 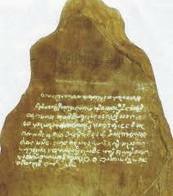 Unfortunately much of the stone is inscribed in Lampung worn with age, so that the contents of the script is written it can not be read in full, making it difficult for us to understand its contents. 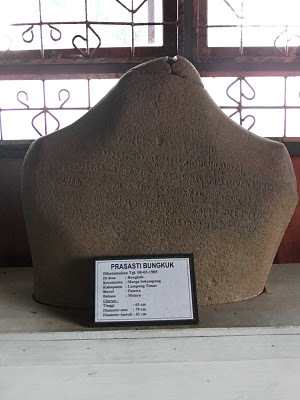 These inscriptions have been known to exist in 1958, in the village near Palas Pasemah Kalianda South Lampung Regency. This inscription is written in 13 lines, lettered Pallawa and Old Malay. It contained nearly equal to the contents of the inscriptions of the Regional Coral Brahi Edinburgh, City Limestone stele of Bangka and Humpback Inscription of East Lampung region, which contains a curse that does not obey and submit to the ruler of Srivijaya. This inscription is not framed in, but based Paleografinya be at the end of the 7th century. This inscription is found on the edge of Banana Way, South Lampung regency in 1957. Until now, the inscription is still located in this area (in situ). The inscription round-oval-shaped half is lettered Pallawa and Old Javanese language, does not contain a number of years. Based palaeografi (the science of ancient writing), the inscription is thought to have come from around the 7th century AD. Palas Pasemah inscription consists of 13 lines is almost the same as the inscription Brahi Coral and Lime City, contains a curse for those who do not obey the king of Srivijaya. 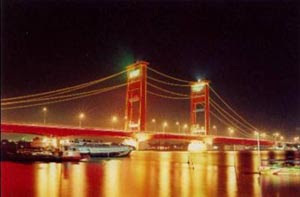 Discovered in 1985, in the village of Humpback, District Jabung, East Lampung Regency. This inscription is composed entirely of 12 and 13 lines of text and lettered Pallawa Old Malay. Conditions have a very worn and broken, the first and last few lines can not be read at all. Of rows that can read the contents of the same curse contained in the inscription Pasemah Palas. Inscription Rock Inscription Brahi and Lime City is Srivijaya inscription from the late 7th century. This inscription is found in the Village Hanakau, Behind the Hill District, West Lampung regency. The discovery was first reported by the officer conducting topographic mapping agency in 1912. Ancient World by Tim epigraphy, the inscription is also called Onion inscription, because the discovery was in the Onion. Inscription This inscription is also called Hujunglangit is based on place names mentioned in the tablets. Stone inscription shaped like a cone with the height from ground 160 cm, width under 65 cm, width of 25 cm. 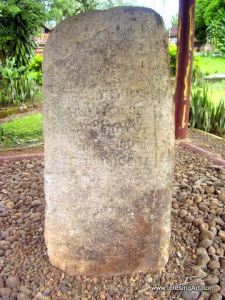 Stele inscribed with part surface is almost flat, consisting of 18 lines of writing with letters Old Javanese and Old Malay language. From the late 10th century, this inscription is worn out and his writing is very thin making it difficult for a thorough reading. Based on its origin, said Sa - land and replication with Hujunglangit place names, can be a member hint that the inscription relating to the establishment of a region into sima, the fief, as found in inscriptions in Hindu-Buddhist era. Determination of a region into sima, generally related to the presence of a holy building located in an area. On top there is an image field that tertuilis dagger, dagger tip facing right. Dagger image is similar to the remains of the royal dagger Pagaruyung The Madang named Sari. According to dynamic, from Pagaruyung dagger was made in the XIV century AD, so about 300 years younger than Hujunglangit inscription. Relief also found a knife on Panataran Temple, whose shape is similar to a dagger The Sari Madang. Stone written oval measuring 237 cm long, wide at the center of 180 cm and 45 cm thick. 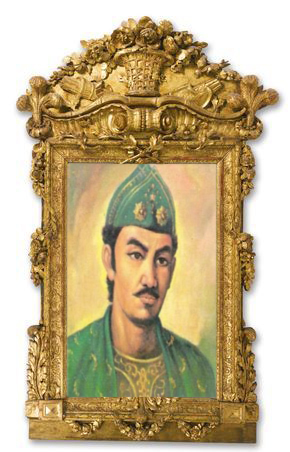 The inscription was discovered in 1970 in the village of Tanjung Raya I, West Lampung District of Sukau. Inscription written on the stone surface is worn out and damaged condition, consists of 8 lines and hard to read but can still be known as Old Javanese letters of the 10th century. At the top there is a picture of a vessel with a curved edge out a leaf. Given the difficulty of reading the contents of this inscription is not known. The inscription is on the stone complex of megalithic sites guns, in an area of 100 x 50 m. The complex is located on flat land higher than the surrounding area. By the regional government of Lampung, in this land has made the park is equipped with walkways, places to rest, and home information. Complex I or Complex Stone Bedil Megalithic and the inscription has also been on the fence wire. Fencing is done by P3SPL (Project Implementing Heritage and Archaeology Lampung Province) in 1991. The entrance of land located in the south. On this land there are inscriptions in addition there are also a group of menhirs the quadrilateral formation. Also in this location there are also distribution of large stones. The inscription is at coordinates 05 ° 18.637 'S and 104 ° 42.041' E (readings with the Garmin GPS V). The inscription written on a piece of rock measuring 185 cm long, width 72 cm, 55 cm thick. Writing an inscription carved on the stone facing north. Inscription comprised 10 rows with about 5 cm high letters. The article is in one frame. At the bottom of the frame there are scratches formed padma or lotus flower. Condition of the letter is worn so many letters that are no longer legible. In the west there are 14 menhirs inscriptions that form a square formation. Menhir, Menhir is a natural stone that showed no signs of human workmanship. Besides menhirs in this area also contained a number of large stones. Judging from the shape of the stones as possible menhir and dolmen. Based on observations of surface soil artefaktual the findings obtained in the form of ceramics and pottery shards. Distribution of stone found in the area Bedil Stone can also be found in several locations outside the fenced area. In the west fence Complex inscription is approximately 50 m there is a stone mortar, which by the society called the Stone of Dimples. Also near Stone Dimples also contained three flat stones. In addition to the south of the fence is about 50 m there is a clustered distribution of natural stone. 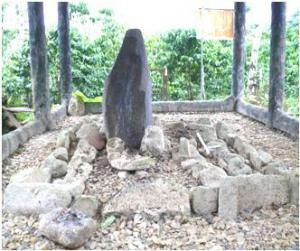 Distribution of the stone is located in the coffee plantation owned by local residents. The inscription on the stone inscription is very worn Bedil so difficult to read. Based on the comparison of the letter, Bedil Stone inscriptions are thought to originate from the late 9th century or early 10th century. Some words are legible is Namo Bhagawate in the first row and Swâhâ on the tenth row. According Soekmono based on these words indicate that Bedil Stone inscription contains about Buddhism or Shiva mantra (Soekmono, 1985: 49-50). Thus the Stone Inscription Inscription Bedil and Ulu Belu indicates that the equation contains the spells. Stone Inscription Bedil finding the location is on land that is bounded by two rivers. Archaeological relics found in the area between the two rivers is composed of three clusters. The first cluster is a collection of Stone Bedil I menhir, flat stones, and inscription. The second cluster is Bedil Stone II with the remains of menhirs, dolmen, scratched stones, and stone mortar. Bedil Stone I and Stone II Bedil may constitute a unity. Community activities now result in the separation between Batu Batu Bedil Bedil I and II. The third cluster is the site of Batu Gajah. On this site there are the remains of menhirs, stone elephants, buffaloes and stone. The stone inscriptions between the contents of Bedil with other archaeological remnants appears there are concerning aspects of religious conformity. Menhirs, stone elephants, buffaloes and stone relics show that had something to do with trust megalithic tradition. 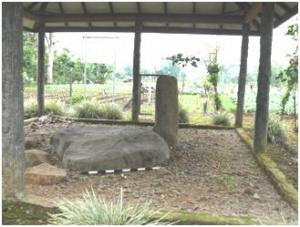 Menhir is an upright stone that has been done or not, and deliberately placed in a place to commemorate the ancestors and the hope of prosperity for the living (Soejono, 1990: 213). Menhir can stand alone or grouped to form a certain formation. Inscriptions found in the Hamlet of sudden, Cliff Village, District Representative Across, East Lampung in 1994. The inscription is written in 14 lines of text, besides there are also short writings and drawings that fill the entire surface of the inscribed stone shaped like a beam measuring 42 cm x 11 cm x 9 cm. Writing used is similar to the ancient Javanese writings from the late 15th century with the language that is not too ancient Malay (Bahasa Melayu Madya).